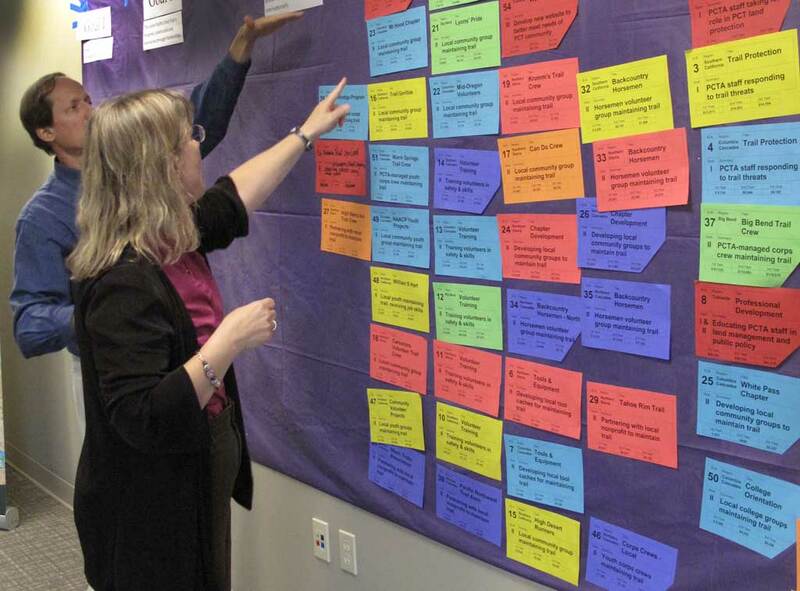 Working on a multi-year plan for the trail. Meandering from Mexico to Canada, the Pacific Crest Trail connects diverse landscapes, offering a gateway to recreational adventure and a connection with nature. The PCT has the rare honor of being a National Scenic Trail. The scenic, biological and cultural resources that surround the trail are as much a part of the trail experience as the trail itself. We see our role as helping to preserve and manage more than just the tread. We believe in the establishment of a special management corridor on public lands that will protect the trail, the surrounding landscape and the Pacific Crest Trail experience. Learn more about what we mean by the Trail Experience we are striving to preserve. To achieve our goal of protecting, preserving and promoting the trail, we are active in management decisions that may affect the trail and the trail experience. PCTA’s Trail Operations department, especially our regional representatives, partake in an immense collaborative effort. We work with our partners to improve trail signage, assist with resource management issues, and develop protocols for managing wildfires, amongst many other issues. 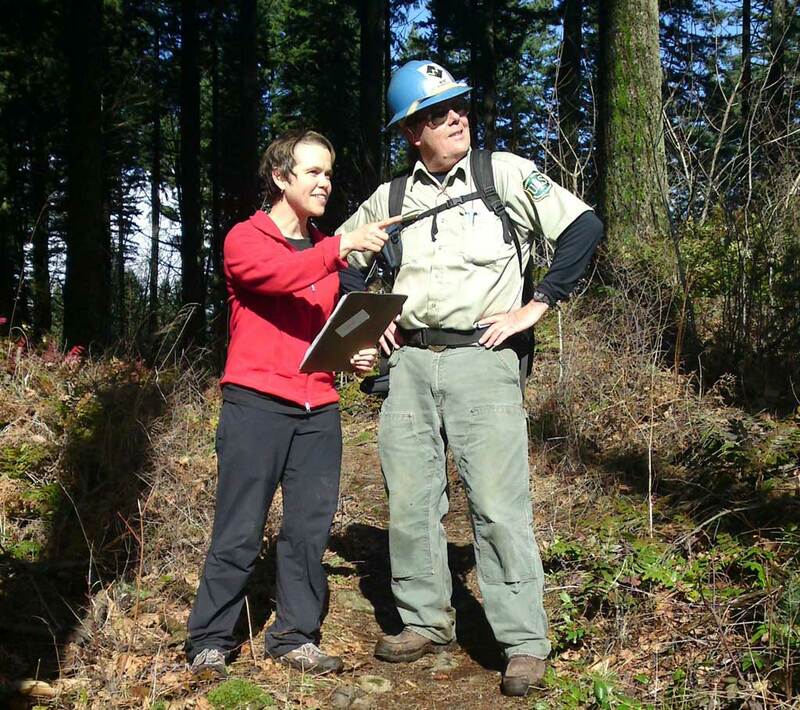 PCTA’s Dana Hendricks and late USFS trail champion Jim Proctor acting for the camera. Traversing three states, three national monuments, seven California state parks, seven national parks, 24 national forests, 48 congressionally-designated wilderness areas, and countless parcels of private land, the PCT is truly managed with an “all-lands” approach. The mission of the PCTA is to protect, preserve, and promote the trail across these diverse boundaries. Working closely with agency partners, we take an active leadership role in the management and protection of the trail within agency units, as it crosses intra- and interagency boundaries, and on privately owned land. Wildfires, floods, vegetation encroachment, erosion, resource development, and illegal use are constant threats to the PCT and the surrounding landscape. These challenges know no man-made boundaries. PCTA is an active leader using such an inclusive approach to management, conservation, and restoration. Public lands along the Pacific Crest Trail are guided by extensive land and resource management plans. These multi-year documents guide agency policy and have deep and long-lasting effects on the PCT and the trail experience. Such plans require collaboration. As the government’s major partner in the management of the PCT, we track and influence favorably a large percentage of the plans that affect the trail. Visitor Use Management is the art of achieving the best possible balance between freedom to enjoy the trail and minimizing the impact of the many people who seek that freedom. To learn more about our VUM efforts, read our Visitor Use Management pages. 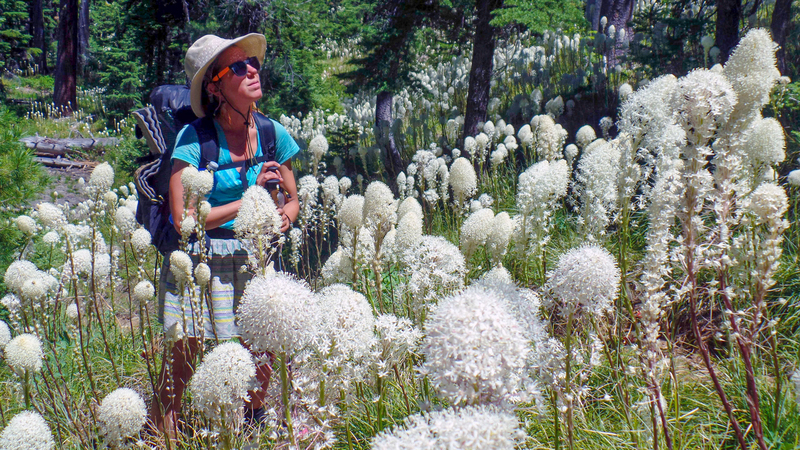 Transfixed by the late spring bear grass bloom in California’s Siskiyou Mountains – photo by Aaron Krogh. Are you interested in how many people hike and horseback ride the Pacific Crest Trail? How many thru-hikers there are? Please visit our PCT visitor use statistics page. PCTA staff and partners out on a site visit. We perform trail assessments that are not directly related to trail maintenance. From land surveys to signage tallies and cataloging resource damage, knowing what is out there is the first step towards thoughtful change. These surveys frequently lead to the creation of better policies and procedures for the trail. One way we strive to improve the PCT is through the use of Optimal Location Reviews. The OLR is a collaborative process whereby the PCTA works closely with agency partners, stakeholders, and local volunteers to identify the best possible recreation experience for PCT users now and in the future. 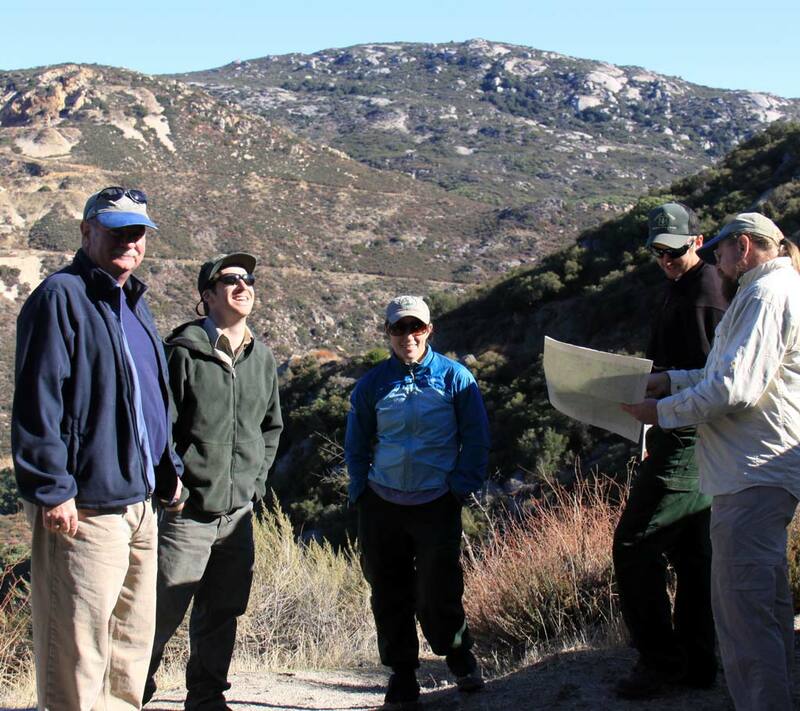 Many factors are considered when conducting a review, but the desired result includes a trail location that will offer users an outstanding quality recreational experience on public lands. The OLR process is linked to land acquisition to protect the trail. It assures that lands are purchased to protect the best trail location. In 2008, The Tejon Ranch Company unveiled a landmark conservation and land use agreement that provides the framework for conserving up to 90% of Tejon Ranch’s landholding. The conserved region amounts to 240,000 acres. This is great news for the PCT. A significant part of the plan includes a layered set of easements that will allow the PCT to be relocated from the floor of the Mojave Desert to the crest of the Tehachapi Mountains. Read more on our page about relocating the PCT to Tejon Ranch. Between 2005 and 2006, an OLR was conducted on approximately 50 miles of PCT within Bureau of Land Management administrative boundaries in Southern Oregon. In 2009, following an Environmental Assessment, work began on a 1.5-mile relocation. Youth crews, AmeriCorps crews and local volunteers, completed the new section of PCT, which opened to the public in May 2011. The original location of the PCT was on the east side of the Green Springs Mountain where it paralleled an oft-used dirt road and offered limited views. The new section is on the west side of the mountain away from the road and through open mountain meadows that offer sweeping views of the Siskiyou Crest and the Rogue Valley. It’s a much-improved recreational experience for hikers and equestrians. Interested in learning more about our activities? We regularly publish trail protection updates in our member magazine, the PCT Communicator. Join us in protecting the trail.